RuneScape game is populated with many non-player characters (NPC’s). They are not controlled by a player, but by a computer, and have pre-defined functions, such as store owners, quest contacts, bankers or civilians. Many non-player characters perform other vital duties like give out quests, sell items, restrict access to certain areas, give information, hand out rewards, etc. Some NPC’s don’t have useful functions. They are created to provide interesting atmosphere or just continue the story. Players can recognize NPC’s by the yellow color of their names. Hans was release on 4 January 2001 which makes him the first RuneScape NPC. He is walking around between Lumbridge castle walls and castle. You can recognize Hans by his red shirt and grey pants. Functions: By right-clicking age on Hans or by his dialogue’s fourth option players can find their time spent online, and how long ago their account was created. 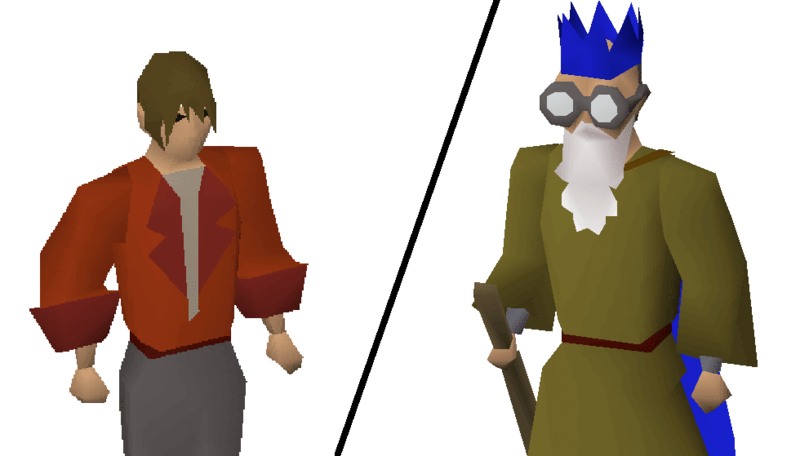 The Wise Old Man, named Dionysius, is by far the most famous RuneScape non-player character. He is very powerful Saradominist wizard and a legendary former adventurer. The Wise Old Man can be found in Draynor Village. He is dressed in light brown robes and a regular blue cape. He wears party hat and specs, and wields a short staff. Functions: Players can hear all Wise Old Man’s the adventures in Gielinor if they ask him about them. Dionysius can check players’ bank and remove any junk, or unneeded free to play quest items. He can also assign various tasks on member worlds and give small rewards in return. This entry was posted in How-To Tips & Tricks, Latest OSRS News, Old School RuneScape, OSRS Mobile App, RuneScape 3 and tagged buy old school runescape item, buy oldschool runescape gold, buy runescape account, buy runescape gold, buy runescape powerleveling, cheap OSRS gold, OSRS mobile app. Bookmark the permalink.